One day when Tourstart and Bridgestone spoke together, the discussion came down to a competition. Why not try to find some great gifts and offer this to motorcyclists? Great idea - so what is more natural then offering gifts with "The Doctor" as Bridgestone is sole supplier of tires to MotoGP, where the doctor is having a fast and fun time. Bridgestone found those great gifts, which is now up to you to win. The following weeks, we have some other great Bridgestone stuff to put on stake - so stay tuned. Tourstart is a great web site, so why not share this with your friends? At the same time, you can win some great prices. 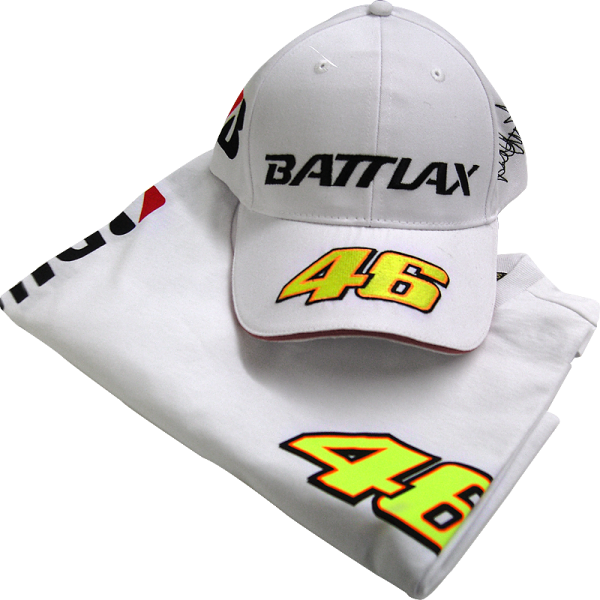 This week´s gift is this cool Bridgestone exclusive T-shirt and Cap with "The Doctor" - alias Valentino Rossi. The one who gets most friends to sign up on Tourstart will win. On Sunday 16. September at 22:00 we will count and announce the winner. Click here to participate www.tourstart.org/competition. May the best biker win.